The Girls of the Finest return with a brand new 2018 calendar project! It’s that time of year– when the talented costumers of the Girls of the Finest put their needles, thread, time, and talent toward a project that aims to give back to our men and women in uniform! Since 2015, these cosplay artists have produced an amazing G.I. Joe-themed calendar showcasing your favorite ARAH-era femme fatales. 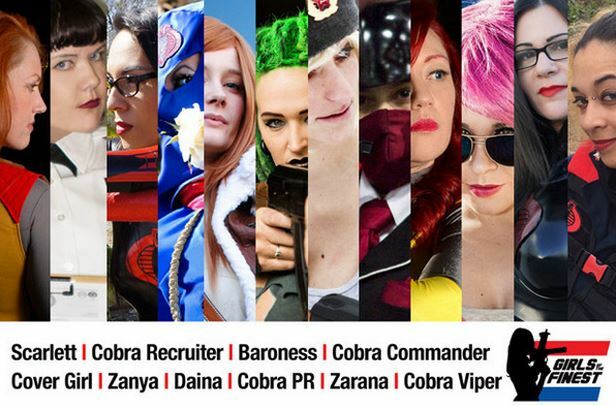 From Scarlett, to Zarana, the Baroness to the Cobra PR Officer– supporters have been treated to 12 months of images that inspire the imagination! However, there’s more to this annual calendar drive than just some terrific wall art. This is a calendar project that aims to give back to those who need our support. Once again, the lovely ladies of Finest are raising funds for K9’s for Warriors, an organization dedicated to providing service dogs for veterans suffering from PTSD, traumatic brain injuries, and/or military sexual trauma as a result of service post 9/11. The organization recognizes the healing power of animal therapy and how the emotional bond formed between a veteran and a therapy dog can help these brave warriors overcome the trauma they incurred while in the line of duty. Seriously– I can’t encourage people enough to support this project. These talented ladies give up their time and talent to support a project that not only helps the men and women of our armed forces but also helps provide homes for animals in need. It’s a no-brainer– a one-two punch that truly brings some comfort to those who put themselves on the line for us each and every day. As of now, the project has 23 days remaining and is 58% funded! This is an all-or-nothing project which means that calendars won’t go into production and no funds will be send to K9’s for Warriors unless it reaches its goal of $8,500.00. A simple pledge of $25.00 will secure a copy of the printed calendar, a set of trading cards, and a postcard! It’s a STEAL of a deal that helps support a great cause! Support the Girls of the Finest 2018 Calendar Project today! Plus follow these costumers and track all of their appearances over on the Girls of the Finest Facebook page! The Girls of the Finest are back with a brand new 2017 calendar! Each year the talented Girls of the Finest put their costuming abilities to work to raise funds for a worthy cause by producing an amazing G.I. Joe themed calendar. This year is no exception and the 2017 Calendar drive is fully under way on IndieGoGo with just 15 days remaining! This year the lovely ladies of Finest are raising funds for K9’s for Warriors, an organization dedicated to providing service dogs for veterans suffering from PTSD, traumatic brain injuries, and/or military sexual trauma as a result of service post 9/11. The organization recognizes the healing power of animal therapy and how the emotional bond formed between a veteran and a therapy dog can help these brave warriors overcome the trauma they incurred while in the line of duty. I’ll admit it– we’ve been remiss in our duties here at JBL when it comes to this project. There are only 15 days remaining to support this endeavor on IndieGoGo and this is the first time that any news regarding the Girls of the Finest 2017 Calendar Project has been featured on JBL. Ladies, I wholeheartedly apologize for that omission. Your work this year has been stellar! Seriously folks– I’ve supported this project for the past two years and the calendars are always top-notch! The photography is fantastic, the costumes flawless, and you sense the passion that these ladies have for their work in every image. Plus, each year the funds raised from the calendar project help support our troops. A simple donation of $25.00 secures your printed copy of the 2017 calendar. Those who donate $50.00 receive a set of trading cards AND a calendar! Plus there are even MORE perks available at other financial levels! Support the Girls of the Finest 2017 Calendar Project today! Plus follow these costumers and track all of their appearances over on the Girls of the Finest Facebook page! Girls of the Finest 2016 Calendar is FULLY FUNDED! The Girls of the Finest 2016 Calendar is fully funded! Not only that, but the lovely ladies of The Finest managed to blow past their original goal of $8,500 and have raised a total of $9,200 to produce the calendar and support the USO! Thanks to all who donated to support the project and, to the Girls of the Finest, the staff of JBL would like to offer our hearty congratulations! You not only achieved your goal but you surpassed it! Supporters of the Girls of the Finest 2016 Calendar can keep up with the latest project updates over on IndieGoGo.com. 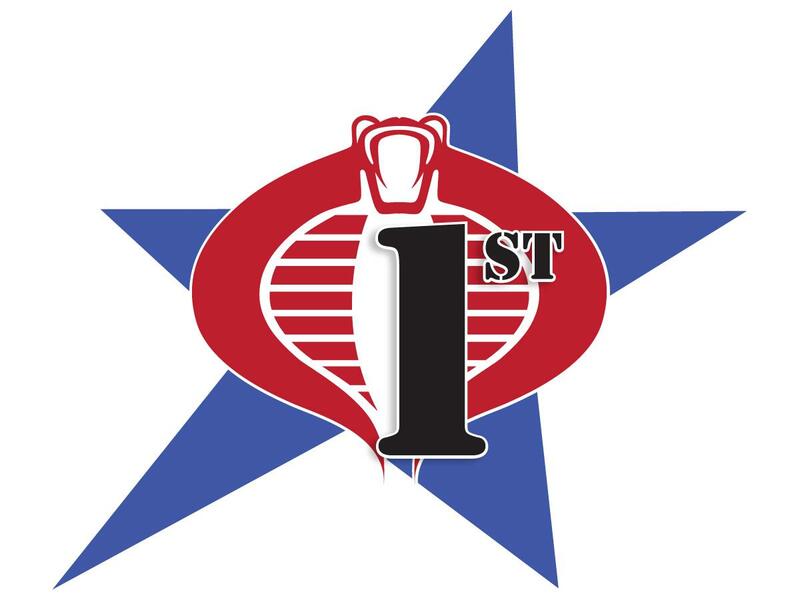 Cobra 1st Legion hits October events in force! 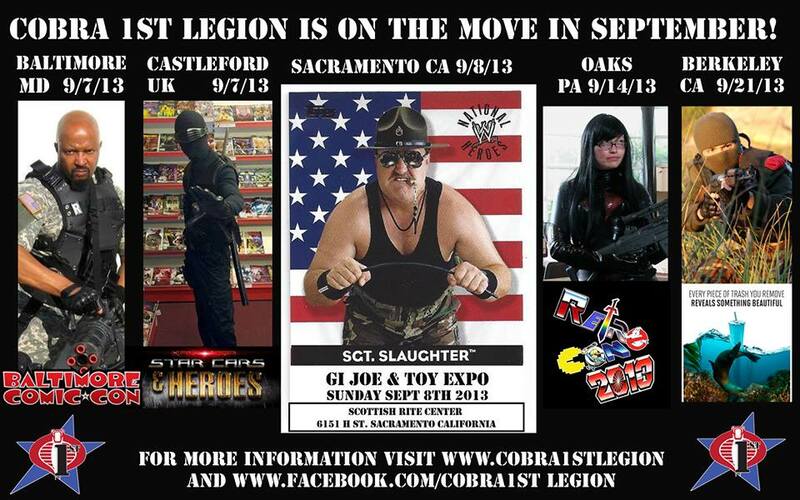 The Cobra 1st Legion in on the move once again!!! Seriously– if you’re living anywhere near ANY of these events, stop on by, pose for some pics with the crew, and give them a hearty “YO JOE!” (or “Hail Cobra!”) to show your support! These talented guys and gals are bringing our favorite Real American Heroes to life for fans across the nation! 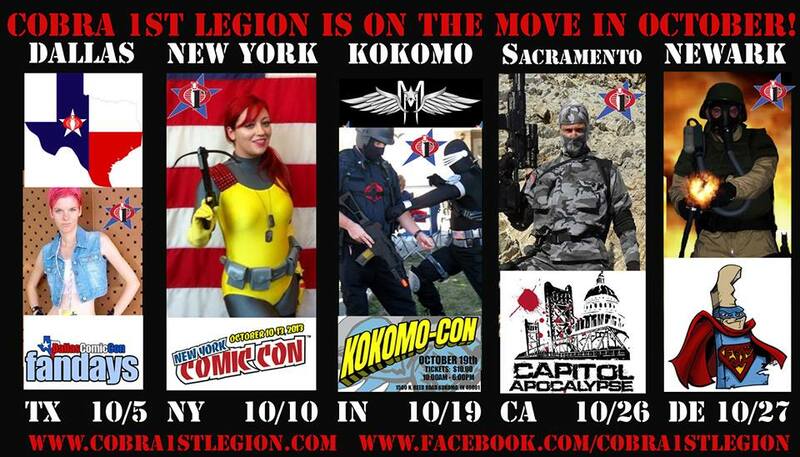 Cobra 1st Legion is on the move at local events! The Cobra 1st Legion is on the move once again! These dedicated cosplayers have wowed the fandom in the past not only with their amazing costumes but also with the high-quality photo shoots they’ve produced at locations such as Alcatraz Island! However, this 200 member strong group isn’t just content to show off their uniforms– they’re also focused on increasing positive awareness of the G.I. Joe brand and focused on giving back to their communities! For more information on the Legion, visit their Facebook page Cobra 1st Legion or Cobra1stLegion.com and find out more about this dynamic group of individuals spreading the word about our favorite Real American Heroes!